Have you ever wondered how some people seem to make moving house seem so easy? Well more often than not you’ll find that they made use of our removals services in Shoreditch, N1. With all sorts of basic and comprehensive removal packages, our Moving Service team are sure to have a service to suit your house removals. So if you hate packing boxes or loading up the van, or if you just hate doing hundreds of trips in an under-sized van then now might be the time to take a leaf out everyone else’s book! Our moving team can give you access to large removal vans, experienced movers and optional packing services at unbelievably low prices. With a service for anything and everything, our local team can make sure that your house, flat or office removal goes without any hitch or delay. Late moving vans in Shoreditch, N1 breakdowns and inexperienced movers are all a thing of the past when you book with us, that is why our professional moving firm in Shoreditch is known for being one of the best in the N1 and E1 districts. For more information, check out our handy website or call our moving team on 020 8746 4402 for a chat. Falling within the London Borough of Hackney, the area is fashionable part of north London. 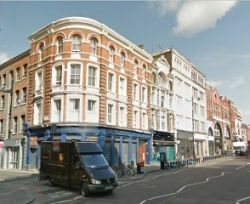 Located just south of Hoxton, it is 2.5 miles northeast of Charing Cross and is in zone 1/2 of London’s transport areas. The nearest tube station is Liverpool Street which is on the Hammersmith & City, Circle, Metropolitan and Central lines. There is also an over-ground train station on Shoreditch High Street which links to the neighbouring areas of Whitechapel and Hoxton. Since the late 1990’s the area has grown in popularity and has become a trendy place full of independent shops, bars and restaurants. Often linked with the vibrant district of Hoxton, it is now a creative hub which is home to a number of internet technology firms. Old Street and Curtain Street are also known for their stylish clubs and pubs and are a popular hang-out with trendy creative types. Following its rise in popularity, the N1 and E1 areas have become very desirable districts for professionals with house prices rising accordingly. If you’re still concerned about your upcoming house relocation in Shoreditch, N1 then don’t forget to check out our moving credentials. Our team are experienced at working on the largest removal projects in the area and are the favoured firm for all sorts of residential and commercial removals. With a huge range of equipment and a great range of services there is no move that we can’t manage. Even if you only have a few small boxes to move we are sure to have a van hire or man and van deal that will suit your needs. Unlike some moving companies we can also offer an extensive range of additional removals services in Shoreditch, N1 including packing services and international freight arrangement. All of our movers are skilled at wrapping items and can ensure that sharp corners, delicate items and family heirlooms are wrapped with the utmost care. If you’ve got the packing and unpacking taken care then you may still be interested in our after-move tidy up. Our optional clear-up service includes the removal of old moving boxes and packing materials and can help you to get settled in your new address ASAP. So why hang around when you know we’re the right removals firm in Shoreditch for you? Just call 020 8746 4402 to book our Moving Service services now! I chose this moving service as my mum had used them for her house move to Shoreditch. I was not disappointed. Moving Service was professional from beginning to end!